In this post I am explaining how German general elections work. This year a lot of countries will hold general elections, local elections and presidential elections – we just had one in Holland, as I am writing this France will decide who will be the next president. In the UK we have the next GE in June and on the 24th of September Germany will decide if Angela Merkel will remain the Chancellor for the fourth time. So how does this all work in Germany? In Germany we have Bundestagswahlen (federal elections / general elections) every four years. These elections decide not only who will be members of parliament but also indirectly who will be Bundeskanzler (Chancellor) – the equivalent to the PM in the UK or the President in the US. The biggest parties in Germany – currently CDU/CSU and SPD nominate the candidates for the top job. So this year, it’s between serving Chancellor Angela Merkel and Martin Schulz. The minor parties also have their own candidates, but this election will predominantly decide between these two. (Check out this link for the other parties and their candidates. The Bundeskanzler (Chancellor) is elected by members of the Bundestag (parliament) not directly by voters. German citizens get the right to vote when they reach the age of 18. Any German citizen over the age of 18 can also put themselves up for election – and doesn’t have to belong to a party but can run as an independent candidate. In contrast to the UK system where one party will get the majority (first past the post) the German system doesn’t allow for a majority rule – and that’s a good thing in my view. This is called proportional representation. It allows for the forming of coalitions. Deutsche Bundestagswahlen – German federal elections. The ballot paper consists of two votes. The Bundestag is made up of: candidates who won their electoral districts and candidates from the party lists according to the proportion the parties receive from the second vote. This is why it’s called proportional representation. There are two votes in this type of election. 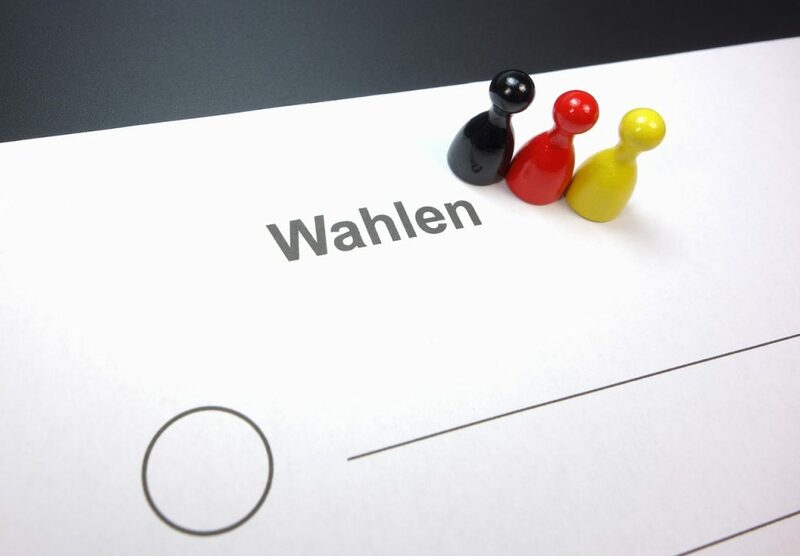 The first vote is a vote for a direct candidate, who should get the plurality vote in his/her election district or Wahlkreis, i.e. the candidate, who receives the most votes, wins. In a case of a tie, the lot drawn by the leader of the regional election decides. In total there are 299 Wahlkreise (constituencies) in Germany and the same number of mandates in the Bundestag are also distributed to the elected candidates in each district. It is important to note that the first vote does not determine the power of the parties in the Bundestag. For each direct mandate in a Bundesland the party always receives one mandate less from the second vote. The second and most important vote is for the party in each province as established by the party caucus. This vote basically determines how many seats every party in the parliament has. However, only those parties who pass the 5% hurdle (Fünf-Prozent-Hürde), i.e. who get 5% of second votes nationwide or if at least three candidates receive direct mandates (this is called Sperrklausel) will enter the Bundestag. The amount of candidates entering the Bundestag is determined by the proportion of votes among all parties and corresponds to this proportion. There are a few additional rather complex rules, but I don’t really want to fry your brain. After the election: determining the election result. Once the Wahllokale (polling stations) are closed, the votes are counted in every polling station including postal votes and special districts. The results are passed on to the Kreiswahlleiter – returning officer of each district – who announce the results for the district, which is important for determining the direct mandates. Each Kreiswahlleiter passes the results on to the Landeswahlleiter- returning officer for the whole Bundesland (federal state). Each Landeswahlleiter establishes the result for the Bundesland and passes this on to the Bundeswahlleiter, who collects all results and announces who in the 299 districts has won a direct mandate. He also announces the distribution (or allocation?) of the mandates of all parties. If a party can’t reach the absolute majority in the Bundestag (it doesn’t happen very often), it has to either build a coalition with another party or risk a minority government. In the case of a coalition a contract is agreed on and often the deputy of the Bundeskanzler is someone from one of the smaller parties and has the very important role of Aubenminister (Foreign Secretary) – for example: Hans-Dietrich Genscher (FDP), Joschka Fischer (Grüne), Guido Westerwelle (FDP), Frank-Walter Steinmeier (SPD) and Siegmar Gabriel (SPD), who is the current Aubenminister. The Bundeskanzler is elected in a secret election a few days after the new Bundestag is established. I hope you found this article interesting – I have to admit I had to look up a lot of this and that I haven’t voted in a Bundestagswahl since 1998, because I moved to the UK in 2002. ← German animal phrases that you might find funny.